The ideal conditions for astronomy are usually the least favorable for humans : High altitudes, cold temperatures, miles away from civilization and infrastructure. Or if you are really lucky, orbiting the earth in the vacuum of space without oxygen, outside the atmosphere like the Hubble Space Telescope. But let’s face it, 99% of us backyard astronomers contend with light pollution, atmospheric pollution, limited sky views due to buildings and simply being tethered to electricity, internet and our equipment at home in the urban sprawl. Here are 5 things for the urban astronomer to try for improving their visual or photographic astronomy goals. Even if you live in the city, the light pollution is usually no match for the sun, moon and the brighter planets which can still be observed and imaged with an excellent degree of success. Where possible, plan your session when the target is at the “zenith” which is a fancy word that means straight up above you. This means you are looking through less smog and atmosphere than you would if it were closer to the horizon, and always gives you a better chance for improved clarity and detail. This animation shows the difference a single streetlight can make to the visibility of the night sky. Ok I’m not condoning any specific act of civil disobedience here but suffice to say, if a streetlight near me becomes broken I certainly won’t be reporting it to council! There are actually a few things you can try to deal with a streetlight that may be throwing light into your astronomy area. Write to your local member, mayor, representative or councilor and request that they remove the globe. Be polite and respectful; emphasize the unnecessary light pollution being thrown onto your property and the energy being wasted during the night. The more of us that do this, the more likely local councils will begin to implement procedures for it. Disable the streetlight with a laser by pointing to its light sensor if you can find it. This should switch the streetlight off, though you may need to mount the laser and keep it on for several hours to keep the streetlight switched off. This is a non-destructive way to turn it off when you need it dark. Pay some local kids to use their BB gun and … no no, I wouldn’t suggest such a thing! Try researching some other non-destructive ways to disable the streetlight. Some types can be disabled with a small tap at the base of the pole, which triggers a safety mechanism to cut the power in the event of a car crash. You might get creative and cover it with a potato sack, or erect a small shield to throw a shadow over the telescope. If you come up with anything novel - let me know! A relatively small inexpensive filter can make a big difference in cutting out the destructive glow of your town or city. The main two are the Ultra High Contrast (UHC) / Light Pollution Reduction (LPR) variety or a City Light Suppression (CLS) Light Pollution Filter. The only difference between them is the range of light they block. A CLS filter essentially “throws away” light from sodium and mercury vapor lights, which range from orange to green. A UHC filter is stricter though and throws away a greater range of light, which will be better if you are surrounded by white-light streetlights that assault you with all the wavelengths of the rainbow! A filter will typically sit under your eyepiece screwed into the thread, or in your “image train” between the scope and the camera for photography. Canon DSLR cameras also support “clip filters” which can be inserted into the camera itself. The author at QLD Astrofest, an Australian star party. A persied meteor tail can be seen overhead. Unfortunate but sometimes necessary, there’s nothing quite like an actual dark sky. Check a light pollution map online (e.g. http://www.lightpollutionmap.info or http://darksitefinder.com/maps/world.html ) to work out how far you’d need to travel to find a dark, or darker sky than you have in the city. Travelling with astronomy gear can take some effort and planning, but the rewards are well worth it. 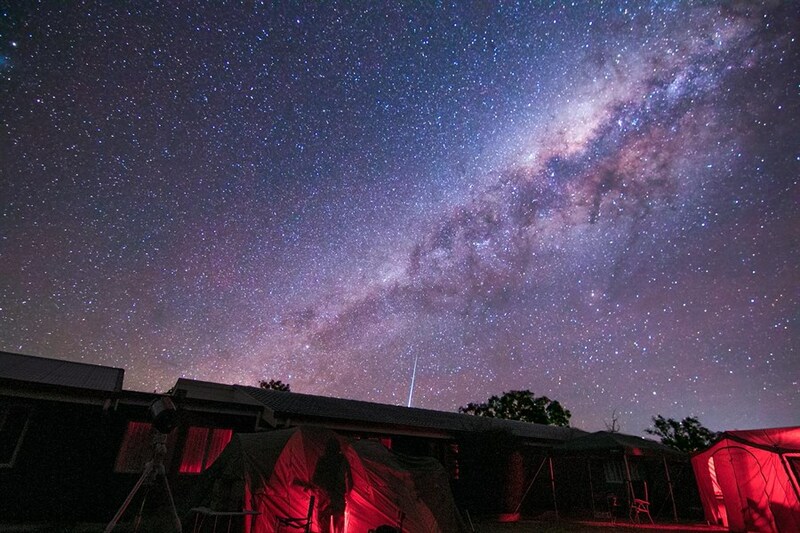 If you are not confident to go out on your own, check with your local astronomical society for nearby star parties which usually provide campsites, power, amenities and dark skies for astronomers to enjoy. Of course, they are also lot of fun as well, and it’s good to connect with other people just like you chasing celestial wonders! 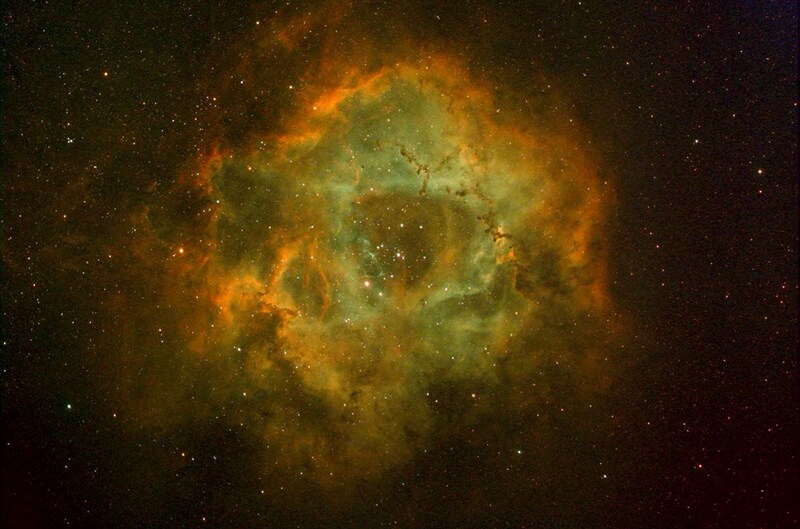 The Rosette Nebula in Narrowband (Hubble Palette). Taken with Celestron 9.25” Edge HD w/ HyperstarIII reducer and Baader highspeed narrowband filters. 5. 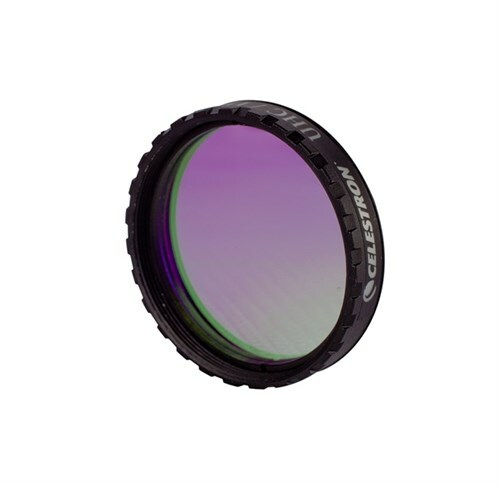 Use Narrowband Filters – The Magic Bullet! A somewhat expensive but extremely effective strategy is the use of narrowband filters to cut through the light pollution like a hot knife through butter. Unlike the light pollution filters, which block a large portion of the visible spectrum, a narrowband filter blocks ALL the available light apart from a small “line” of known chemical spectra. The most popular is Hydrogen Alpha, or Ha, and should be the first one you buy. It reveals all starlight and emission nebulas in bright, beautiful detail as if you were in the darkest desert, but from the middle of the city. Narrowband images are monochrome (effectively black and white), but can be combined with other narrowband filter images such as OxygenIII and SulphurII to produce stunning false colour deep space astrophotography with virtually no stray city light whatsoever, as if by magic: seeing the unseen. Many city observatories are setup this way. As a bonus, you can even image nebulas when the moon is out. With enough separation between the moon and the target any degradation will be limited to a gentle gradient, easily fixed in post processing. We can’t all live in a remote dark sky location and afford to earn a living as well (usually to pay for more telescopes and equipment!). 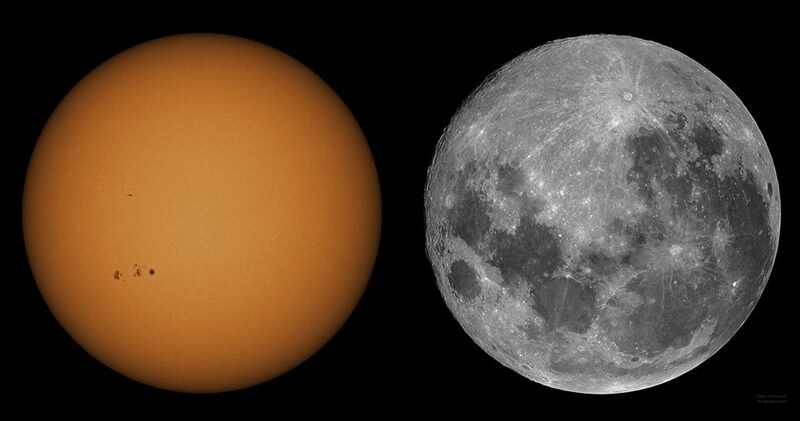 That’s why urban astronomy is one of the most popular but challenging aspects of astronomy and astrophotography today. Hopefully some of a few of these ideas will help you forge your own niche against the ubiquitous scourge of urban light pollution. Dylan O’Donnell is an amateur astrophotographer from Byron Bay, the easternmost point of Australia where he images space in relatively dark skies apart from one super annoying streetlight he disables with a laser beam.